Thank you everyone. Here I am raising a toast to all of you who deserve it! Thank you for all the support all along. Thank you for being with me. Thank you for all of you who made my day with the cheerful comments and funny emails. I know I sound like an Oscar winner but you all mean a lot to me. To those of you who made it to the food bloggers meet-up, CHEERS! My sincere apology for having this come up so late when everyone's thank you posts are up. Please forgive me for not visiting your blogs enough, don't talk about replying comments and emails and replying to questions/comments on my blog, I've done all that now and got myself organized and all settled now. So, sorry once again for the delay. To Joslynn@A Nyonya's Kitchen who brought us the lovely flower (was it Daisy? I'm bad with flower names! ), CHEERS! Thank you so much. Haven't gotten one from Aaron even for Valentine's for years so you really made my day! To Joslynn@A Nyonya's Kitchen who bought me this lovely tissue box cover, CHEERS! I really hope you like the Chai. I have sent you an email on how to make your own Chai. My favourite recipe modified over years, it's thick and full of flavour, I'm sure you'll like it! To Sonia@NasiLemakLover who gave me my most treasured gift of dried Bunga Telang, CHEERS! Just so you know, I have successfully smuggled it into Adelaide declaring it as potpourri. If I ever make pulut tai tai, you'll always come to my mind. Love you! To Joslynn@A Nyonya'sKitchen who so willingly shared with me a packet of the Klang Bah Kuet Teh given by Sonia@NasiLemakLover, CHEERS to both of you! Joslynn knows how a packet of Bah Kuet Teh mixture like that meant for people living abroad. No Sonia, you are alright to make us chose between Bunga Telang or Bah Kuet Teh, I'll pick Bunga Telang anytime! To Elin@Elinluv's Tidbits Corner who got each and every one of us a set of egg mould (you know, the Japanese toy), CHEERS! I have come up with other ways of using the mould to make fancy stuffs other than eggs, will share if I ever make them! Thank you once again! And I must be thinking of Aaron when I was smiling, we are very attached and tend to miss each other a lot, I hope you didn't find that too mushy since you asked in your post, haha! Did I mention Joanna is such a smart and clever girl, saw her results, freakishly smart and outstanding! To Gertrude@MyKitchenSnippets, Joslynn@A Nyonya'sKitchen and Reese@ReeseKitchen, thank you for making me feel young and alive, love the Angpao, CHEERS! Love your company Gertrude, you're warm and nice and all. I know all of you are good people really. To BeeBee@HoneyBeeSweets, CHEERS! What a bravo to flew all the way in from Singapore just to be with us. Really appreciate your attendance. And no, you are not the last person to blog about the meet-up, I am! So, you're fine darling. To Pei Lin@Dodol&Mochi, Tracie@BitterSweetFlavours and SweeSan@TheSweetSpot, CHEERS! However, I really gotta say this to myself, shame on me! I felt so bad throughout the meet-up that I came empty handed when we called off the cookie swap. My bad for being so not thoughtful. Oh well, I guess the more reason for us to meet up again in future so I could make it up to all of you. And Pei Lin, you really do take beautiful pictures, you have that style, flare and everything like a professional photographer. Tracie, you are such a sweet, pretty darling. The youngest one too, enjoyed your free coffee? Haha! Come to Australia, it'll be fun! Swee San, though I've only come to known you through Pei Lin, I felt you are very nice, no need to mention talented. It's displayed through your blog, I'm missing a lot before I came across your blog. Wonderful work! On a separate occasion, like 2 days before the blogger meet-up, I met Angie@SeaSaltWithFood. Thank you Angie for sparing precious moments from your tight schedule. Now I know a lot more about you and I know this is late, but I'm glad you had a safe trip back to Vancouver. I hope you like the antique chopsticks I got you. I bought two, one for me and one for you. I hope you'll like it. Nothing beats photography props for bloggers like us. On another separate occasion, I finally get to meet Zurin@CherryOnACake. Zu, terima kasih. Love the Roti Jala Mould and the Fish-shaped Kuih Bangkit Mould. I hope the set of silicone kitchen tool will come in handy for you. I use it like mad since it can withstand temperature up to 200°C or more. Oh did I mention I raised my toast just now with a glass of aspic? Probably didn't look like it but it was. I raised my toast with a glass of Rosenmuskateller Jelly. Rosenmuskateller or Moscato Rosa is beautifully stunning, though a tad drier than your usual Moscato, nonethless, equally sweet. It has a beautiful steamy rose colour, very delicate tasting and surprisingly fresh. It makes a perfect match to all desserts and dishes which incorporate fruit let it be paired or downed alone. Moscato are usually served well chilled. Before you start doing anything, freeze 2 champagne glasses in the freezer for about 20mins or more. Bloom the gelatine with 2.5 tbsp of cold water and let it stand for 10minutes. Measure out 1/4 cup of the Moscato into a smallish pan and add sugar to it. Whisk it over low flame until all sugar dissolved. Remove from heat and add in bloomed gelatine paste. Stir vigorously with a whisk until dissolved and place it back over a bain-marie if needed, never direct heat else the gelatine would looses its gelling property. Cool down the gelatine mixture until it is warm to touch. Working quickly, remove the glasses from the freezer and evenly pour it into the two freezing glasses. Quickly drop in one blueberry into each glass. Top with remaining champagne into the glasses evenly. Send it back into the freezer to set for 20minutes. Remove it and chill it in the lower compartment of the fridge for at least a night. Watch magic develop the next day. Have fun looking and staring and gazing at a bubbly glass of aspic. You drink it with a spoon! 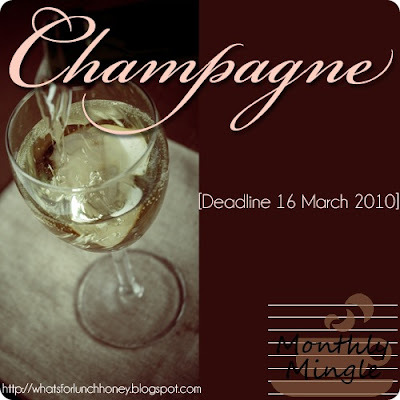 In conjunction with this, I am thus submitting this Rosenmuskateller Jelly to this month's Monthly Mingle, themed Champagne. I modified and reduced the proportion from the existing original recipe here by Heston Blumenthal. Very simple ingredients, just a little more steps to trap more bubbles than your usual glass of champagne. Wanted to trap that little blueberry mid-air but I decided it looked better staying at the bottom. And did I mention, it was a small little blueberry but it looks huge when dropped into the glass (see below to understand). Just the effect I wanted! Here's a not-so-bubbly toast once again to end this post, cin cin! 10 comments on "Raising a Toast"
Quinn, hahaha, luckily nothing happen to you, ya, you can now start to do some pulut tai tai and share with us ok. Thank you Quinn for organizing this meeting. It was nice meeting and getting to know all of you. Hope we can do this again next year. Take care. Thanks, Quinn!!! You made all those possible if it weren't for you initiating the whole thing! You take gorgeous pics, too!! Am sure you're gonna upgrade your photography gear real soon! Till then, take care! Hope to see ya again! Glad to hear you're back in Adelaide safe and sound! Hi sweetie, I can't say it enough but am so glad to have met you and THANK YOU VERY MUCH for the chai tea! A toast to you to for being the one who made the meet up happen. The flower was I think called gerbera. Yes, it looks similar to daisy. The last few weeks were not so pleasant and hardly kept up with blogging. Will resume back soon. Will email you to tell more! Glad you are back safely in Adelaide :)! Ju: Thanks. Yeah, I'm a qualified engineer now.... Everyone who turned up made that happen! Sonia: Yeap, will make pulut tai tai with it. Thanks for the bunga telang again!!! Love it! Gert: Thank you for making it happen by turning up. It was all our efforts really. Zurin: You're welcome. Thanks for your toys too! Muahh...You are so so pretty and cute in person Zu. And you have an outgoing charisma, I wish we have more time! Swee San: That's what I should be saying. I wouldn't know you if it's not for the blogger meeting. You are great, I must sit next to you next time to know more about you!!! Pei-Lin: Thank you and yeap, I believe new camera gear will help a lot but it doesn't help that it's going into winter soon and imagine I work 9 to 5, I have no sun lights for photography. I guess I'll be like you, weekends are our only free slots. Elin: Thanks for the moulds. Open ceremony already :) Yeah I know, I'm as old as your daughter :) We must meet again the very next time I go back KL. Who knows we can do the meetin gin Ipoh and we all eat Ipoh Hor Fun together, hehe. I can't stop slurping Ipoh noodles, so yummy!